Copyright © 2008 - 2010 W3C® (MIT, ERCIM, Keio), All Rights Reserved. W3C liability, trademark and document use rules apply. The WAI-WAI-ARIA Primer introduces developers to the use of WAI-ARIA [ ARIA ] for addressing the accessibility of dynamic Web content for people with disabilities. This primer explains the accessibility problems posed by hybrid technologies such as Dynamic Hypertext Markup Language (DHTML) and Asynchronous Java and XML (Ajax). It introduces the technologies to map controls, Ajax live regions, and events to accessibility application programming interfaces (APIs), including custom controls used for Rich Internet Applications. The primer also describes new navigation techniques to mark common Web elements with roles such as menus, primary content, secondary content, banner information and other types of Web structures. These new technologies can be used to improve the accessibility and usability of Web resources by people with disabilities, without extensive modification to existing libraries of Web resources. This document is part of the WAI-ARIA suite described in the WAI-ARIA Overview. This is a Public Working Draft by the Protocols & Formats Working Group of the Web Accessibility Initiative. It supports the Accessible Rich Internet Applications (WAI-ARIA) [ ARIA ] specification, providing introductory information about the accessibility problem that WAI-ARIA is intended to solve and explaining the technical approach. This version contains information that was previously in the WAI-ARIA specification itself but was deemed introductory and distracting from the main goal of defining Accessible Rich Internet Application features. That information is, however, important for many people to understand WAI-ARIA fully so is provided in this resource. A history of changes to WAI-ARIA 1.0 Primer is available. The summary of actions made in response to comments on the previous two WAI-ARIA 1.0 drafts includes changes that affected this document. Is the relationship of WAI-ARIA to accessibility clear? Are there issues with the implementation of WAI-ARIA in the various technologies affected? Start with the instructions for commenting page to submit comments (preferred), or send email to public-pfwg-comments@w3.org (comment archive). Comments should be made by 29 October 2010. In-progress updates to the document may be viewed in the publicly visible editors' draft. The disclosure obligations of the Participants of this group are described in the charter. 2.1.1. Provision of the Role Attribute: "What is the Object?" 2.1.2. Provision of the Accessibility State Information: "What meaningful properties does this object have at this time?" 2.1.3. Provision of the Keyboard or Input Focus: "What object am I working on?" For an introduction to WAI-ARIA, see the Accessible Rich Internet Applications Suite (WAI-ARIA) Overview. The WAI-ARIA Primer is part of a set of resources that support the WAI-ARIA specification. The Primer provides a basic introduction to the concepts behind and reason for WAI-ARIA, and the WAI-ARIA Authoring Practices [ ARIA-PRACTICES ] describe recommended usage patterns for Web content developers. The WAI-ARIA Suite fills gaps identified by the Roadmap for Accessible Rich Internet Applications (WAI-ARIA Roadmap) [ ARIA-ROADMAP ]. These documents serve as important places of clarification where topics appear to be unclear. Accessibility of dynamic content relies on abstracting semantics from both content and presentational information. Extracting semantic cues from current HTML content is typically unreliable as the cues are limited to tag elements names. While HTML allows content to be repurposed for presentational formatting, it lacks the ability to attach meaningful metadata about document structure and to convey semantic information. A common example of this is content formatted with tables rather than style sheets. When combined with script and cascading style sheets (CSS), HTML can be repurposed to create dynamic custom components without providing a means to convey semantic information to native accessibility architectures designed to support dynamic graphical user interface (GUI) content. Custom components built from common HTML elements often are not keyboard accessible. 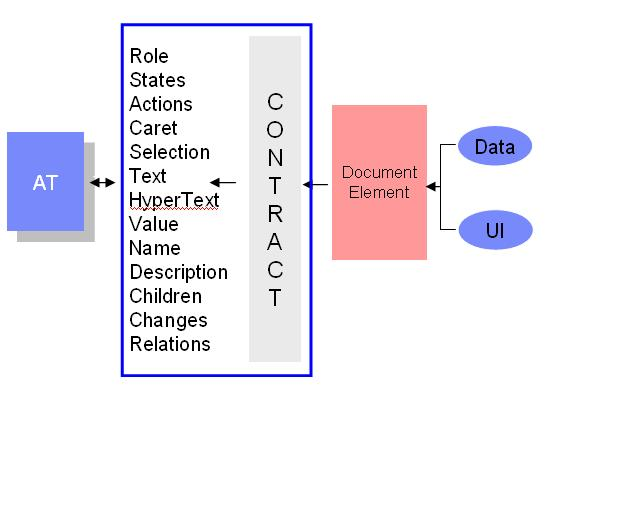 The following diagram illustrates a typical document object model (DOM) node in a Model-View-Controller architecture. Accessibility information surfaced to assitive technologies is provided only by the HTML element's tag name, with only the accessibility attributes that tag can provide. Figure 1.0 shows that on the node, data, or the "Model", which should include semantic information, is separated from the user interface presentation, the "View." Here, the document element is managed by the user agent based on the default behavior of the element. The user agent's default behavior at the document element forms the controller. 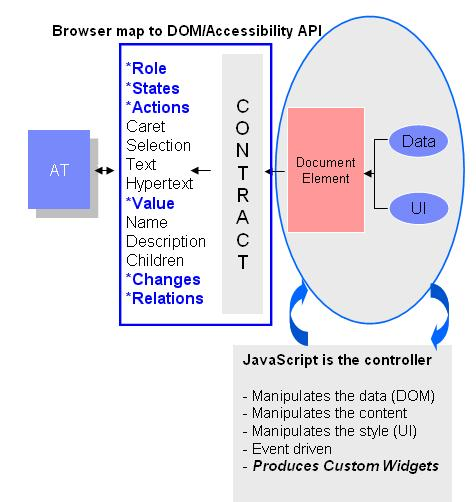 The box between the DOM node and the assistive technology contains the contract provided by the user agent to the assistive technology. This data includes typical accessibility information found in the accessibility API for many accessible platforms for GUIs (role, state, caret, selection, text, hypertext, name description, parent/child information, parent/child information, and relations). For HTML and other W3C markup, the accessibility information provided solely depends upon what the element's tag name and any accessibility attributes that map to that tag provides. For example, the accessible role of a table is table. The author provides an accessible description by assigning a title attribute. Accessibility architecture today is centered around object technology. Each object in an application or document exposes its accessible properties to an assistive technology. This problem needs to be solved quickly. A number of efforts are underway, such that minimal changes may be required to bring them to the level needed. The solution needs to be light-weight in order to promote adoption by Web authors. The solution needs to be scalable; it must make simple things easy while making complex things possible. User agent manufacturers must be involved up front to ensure support for the solution when the specification is complete. To ensure interoperability, assistive technology vendors need to be involved from day one. The effort must leverage support by AT vendors to ensure that a total solution is available when the specification is complete. This is a critical mistake made by people creating a new accessibility model. Developers must be engaged early on so that they can contribute feedback and start producing workable solutions early. What is clear from the problem statement is that developers of dynamic web content cannot provide the appropriate accessibility information in the markup to support the accessibility APIs on the target platform. This problem is not limited to HTML. It extends to other markup, including Scaleable Vector Graphics [SVG]. This primer addresses the problem for web content delivered to desktop browsers and introduces you to common extensions to both HTML and XHTML called Accessible Rich Internet Applications (WAI-ARIA) Version 1.0 [ ARIA ]. The goal is to make these standard features in HTML 5. Using Figure 1.0 as a template for addressing the problem and U.S. Section 508 accessibility standards, Table 1.0 illustrates gaps in the infrastructure and identifies W3C standards that should be used to address the problem. In the right column, table cells that are empty or that indicate a limitation represent accessibility gaps in HTML and XHTML. States, and Property attributes - This is the set of attribute modifications to (X)HTML necessary to provide full keyboard focus and states and properties that may be mapped directly or indirectly to platform accessibility APIs to ensure full interoperability with assistive technologies for WAI-ARIA. Role document landmark values - These values, borrowed from the Role Attribute [ ROLE ] provides a standard set of role attribute values designed to define pertinent parts of a document (landmarks) for the purpose of accessibility. User agents may incorporate device equivalents, such as key mappings in the case of a desktop user agent, to navigate to these sections of a document. Taxonomy of WAI-ARIA role values - The necessary core roles found in Accessibility API sets for Windows and Linux as well as roles representative of document structure, such as banner or treegrid. Use of document structure is necessary for assistive technologies to navigate complex documents and to know when they have entered active areas of a Web page such as in the case of a dynamic scripted Web application. The taxonomy is designed to help user agents or authoring tools determine what properties a given role supports and to assist with accessibility API mapping of these properties. The taxonomy will is like a class hierarchy used to convey semantics and structure and includes knowledge about each role. At this time, that taxonomy is modeled using Resource Description Framework [ RDF ] and Web Ontology Language [ OWL ]. The next section describes how the specifications are used together as well as how they will be implemented in HTML 4. Adaptive technologies, which need to provide alternative access to complex user interfaces authored via HTML, are often left guessing at the semantics behind specific portions of HTML document. As an example, an XHTML document might use a certain HTML construct, such as a collection of DIV tags, to create navigation bars, a site-navigation menu, and other GUI-like user interface widgets. To fix the problem, we incorporate the role attribute, assign the accessible state properties, and give the object focus using the new TABINDEX feature. Addition of this information helps authors to provide the necessary information to enable the user agent to support the accessibility API accessed by the adaptive technology. Each platform accessibility API has the notion of a "role" for a GUI object. This is the case for Java Accessibility API [ JAPI ], Microsoft Active Accessibility [ MSAA ], The Mac OS X Accessibility Protocol [ AXAPI ], and the Gnome Accessibility Toolkit (ATK) [ ATK ], or UI Automation for Longhorn [ UIAUTOMATION ] (called content type in UI Automation). The WAI-ARIA specifications are based on XHTML 1.X and include the role attribute. The "role" attribute takes a qname, enabling authors to reference the role attribute from the WAI-ARIA Roles. In the following example, we use qname to reference the menu role in the WAI-ARIA specification. <!DOCTYPE html PUBLIC "Accessible Adaptive Applications//EN"
WAI used RDF/OWL to model our taxonomy for WAI-ARIA. In fact, if a host language sought to use namespaces or qnames, they could do so to reference the WAI-ARIA role taxonomy. The WAI-ARIA role taxonomy could be used by authoring tool developers to ensure that states and properties assigned to a given role are accurate. Since this is dynamic content, the state of these new repurposed objects will change. The WAI-ARIA specification shall provide the common accessible properties needed to support the accessible state or property information provided by the platform accessibility API defined previously. This specification was created based on an analysis of the accessibility properties defined in MSAA and ATK. The following example extends the previous approach by adding the aria-haspopup accessibility property. Virtually all adaptive technology solutions, such as screen readers and onscreen keyboards, must know which object currently has focus. For example, an author might want to insert text into the current object with focus or to announce information about the object that has focus. With today's HTML 4.01 and XHTML 1.x, script authors can only provide focus to form and anchor elements yet the Document Object Model Specification allows all elements to receive events including keyboard events. This means that HTML, by design prohibits script authors from making all HTML elements keyboard accessible. This single problem effects usability of Web pages where one gains access to elements by using the Tab key on desktop browsers. This slow, unproductive, approach makes portal navigation difficult because all active elements must be tabbed through to put focus on an active element in the last portlet in a document. To solve this problem in XHTML 1.x, we are incorporating a feature in Firefox and Internet Explorer to define the tabindex for -1. This allows a script author to give an element focus without placing it in the tab order: The following table describes these changes that will be incorporated into the new Accessible Adaptive Application specification. Unlike XHTML, HTML 4.01 is non-extensible in that it is not possible to extend HTML 4 through the use of namespaces. That said, members of the working group have worked with the HTML working group to agree on a vehicle that does not use namespaces, which at this time is supported by XHTML and HTML which will be supported in HTML 5 when it becomes recommendation. Firefox 3 is leading the way to implement this, and other browser manufacturers are working to support it as well. The technique allows all role values specified in WAI-ARIA (including those specified by the XHTML Role attribute module) to be specified without a namespace prefix. Additionally, WAI-ARIA states and properties shall be represented as aria- followed by the concatenated WAI-ARIA state or property. In order to validate these extended attributes for HTML and XHTML the WAI-PF working group will investigate the creation of an enhanced schema or DTD for each host language. In addition to the common roles which will reside in WAI-ARIA Roles, both XHTML 2.0, and the XHTML Role attribute module ([ROLE], Section 4) defines a collection of common role, regional, landmarks that define pertinent parts of a document for the purpose of accessibility. User agents may incorporate device equivalents, such as key mappings in the case of a desktop user agent, to navigate to these sections of a document independent of the Web site. The addition of these semantics allows the user agent to provide standardized navigation to common document sections. This is especially important for portals to improve the usability. These may be used as attributes in XHTML 1.x by applying them to sections of the document as shown in this example. Note: since these roles are a part of XHTML they do not need to be namespace qualified. The example above was taken from the header from the Career Center Web page at the University of Illinois at Urbana-Champaign. Students from this university, under Jon Gunderson's guidance created Accessibility extensions for Mozilla/Firefox, in part, to allow a page author or user to view a list of navigation landmarks. This tool, shown in Figure 3.0, lists the navigation sections on the page. Keyboard navigation of the list of navigation bars causes the corresponding document section to be highlighted. The title for each navigation region displays in the list. The WAI-ARIA role taxonomy was modeled using semantic web technology, in the form of Resource Description Framework (RDF) [ RDF ] and the Web Ontology Language (OWL) [ OWL ], as a vehicle to define a knowledge-based class hierarchy for roles. This model shows what states and properties are supported, by each role in the taxonomy. The role in the class hierarchy inherits properties from its ancestors and defines its own properties. Where applicable, semantic web technology is used to define related concepts within other namespaces. This information is critical in determining how to choose a role and how to interact with it. The role taxonomy uses RDF as a way for using data to describe data and provides a W3C standards-based approach to represent this information. <div role="grid"> whereby grid expands to: http://www.w3.org/2005/01/wai-rdf/GUIRoleTaxonomy#grid in the button markup. The power of this design is that it enables a web authoring tool to go back into the corresponding RDF/OWL markup and determine what properties it supports for Accessibility API mapping. Additional, middleware solutions can now make intelligent transformations of Web Content by processing the semantics behind rich browser and rich structured frameworks to adapt accessible solutions for a broader user base. Our immediate goal is to fix the accessibility problem with scripted Web content. Assistive technologies will use the standard roles to determine how to render most content. Accessible role and state meta data from the WAI-WAI-ARIA Roles, States, and Properties specification, are added as attributes to each of the XHTML elements repurposed as GUI widgets dynamically. The user agent, in this case Firefox, maps this information to the platform accessibility API. 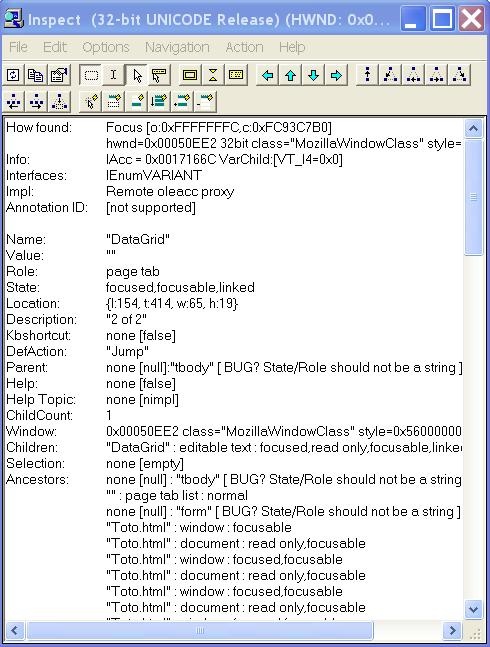 Figure 6.0 shows the Microsoft Active Accessibility rendering of the new accessibility markup provided on the DataGrid page tab which has focus. Knowledge representation of Web content - As a secondary benefit, roles improve compatibility with Knowledge-Based Services and the Semantic Web. By integrating accessibility and the semantic Web, accessibility can be moved forward, paving the way for customized accessible searches and intelligent user agents with additional applications. If it is known that a page hyperlink has the role of taking the user to the site's home page, then that knowledge can be used to create enhanced accessibility in different ways in many different scenarios, such as icons or access keys. If it is known that a text box is for the user email address, then the user agent can support users filling in the form by labeling it with an icon or symbol, automatically validating it, or even form filling. Interoperability between applications and assistive technologies requires event notification for accessibility. The events defined in Table 2.0 will be fired via the user agent. The accessible value and state property changes will be generated in response to changes in the DOM attributes as defined by the WCAG 1.0 AAA specification. User agents supporting the platform accessibility API, will support event notification such as the state change or value change events. HTML 5 and the "serialized" XHTML version of HTML 5 are years away from standardization. We have preliminary consensus to add the WAI-ARIA states and properties, role, and tabindex changes needed for WAI-ARIA in HTML 5 as demonstrated in section 5.1.4. This is subject to change between now and when the specification goes to recommendation. In HTML 5, we will see many more standard controls that developers may choose to use and that should be used in preference to WAI-ARIA features. We shall continue to promote WAI-ARIA's use and adoption in industry to ensure that there continues to be the ability to provide support accessibility of new types of controls. A number of gaps remain, such as named event handlers and enhancements for access key, that we need to address. This work is in progress. This section provides a brief introduction to the process of making applications accessible using WAI-ARIA. The choice and usage of roles can be complex and context dependent. It is beyond the scope of this document to explain implementations for all the possible WAI-ARIA use cases. WAI-ARIA Authoring Practices [ ARIA-PRACTICES ] provides detailed guidance on WAI-ARIA implementation methodology as well as references to sample code. Keyboard focus should be maintained for the duration of the user's interaction with the application. All interactive components should be keyboard operable. WAI-ARIA provides authors with the means to make the different elements in a web application semantically rich. User agents use the role semantics to understand how to handle each element. Roles convey additional information that the assistive technologies need to anticipate the behavior of the elements inside the application such as how to present the corresponding WAI-ARIA states and properties to the user. The user agent will use the accessibility semantics from the host language and WAI-ARIA accessibility semantics (which may augment or override those of the host language) and present them to assistive technologies through the Document Object Model or the platform accessibility API. The user agent will create an accessible representation of each element in the web page, and will use the appropriate accessibility API to notify assistive technologies of changes to the semantics of those elements. Use native markup when possible. Use the semantic elements that are defined in the host markup language. For example, with HTML or XHTML, it is better to use the native checkbox than to use a div element with role checkbox as these should already be accessible through your browser. There may also be cases where WAI-ARIA can augment an existing element in the host language. 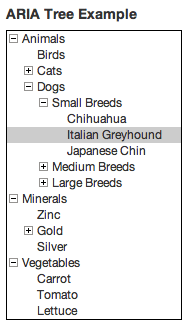 For example, a grid and gridcell elements can reuse the functionality of a table when overlaying it. WAI-ARIA roles, states, and properties are best used when the markup language does not support all the semantics required. When a role attribute is added to an element, the semantics and behavior of the element are augmented or overridden by the role behavior. Set roles to make sure elements behave predictably and correctly describe the behavior of each element within the application, unless element behaviors are fully described by the native markup language. Roles for interactive elements should support all the attributes that the element could use. Once a role attribute is set it should not be changed as this may confuse the end user. This does not preclude an element being removed which has the role attribute set, but only states and properties (aria-* attributes) should be changed for a given element. 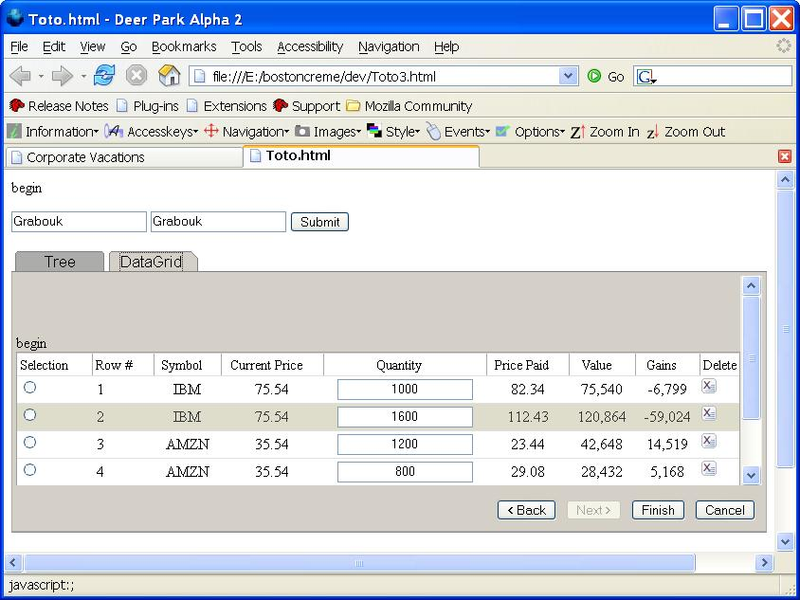 Form logical groups within user interface widgets, such as treeitem elements in a group. Identify large perceivable regions and apply a landmark role to those areas. This will facilitate keyboard navigation. It will also facilitate content management by assistive technologies by providing semantics to manage how much information is rendered at a given time. The use of WAI-ARIA landmarks helps everyone, including vision-impaired users, dexterity-impaired users, and even users with cognitive or learning impairments. For areas of the page that contain a group of elements that are likely to change through an Ajax application it may be specified as a live region, through the use of the aria-live attribute or it may be marked with pre-defined roles, such as log, which has assumed behavior of a live region. Look for relationships between elements, and mark them using the most appropriate property or attribute. For example, if a page contains both a search form and search results region, mark each container as a region and set the aria-controls attribute of the search form to reference the search results. See relationships in WAI-ARIA. Some relationships are determined automatically from the host language, like label elements associated with input elements in HTML. Set states and properties in response to events. Once the role for an element has been set, change states and properties as appropriate during the element's life cycle, usually in response to user input events. Only use attributes supported for the chosen role or element. User agents should notify assistive technologies of state changes. Conversely, assistive technologies' notification of property changes depends on the method by which assistive technologies communicate with the user agent. For example, the aria-multiline attribute (a property) is not something that changes frequently, whereas the aria-checked (state) attribute (a state) changes frequently in response to user input. Support full, usable keyboard navigation. Usable keyboard navigation in a rich internet application is different from the tabbing paradigm in a static document. Rich internet applications behave more like desktop applications where the user tabs to significant widgets and uses the arrow keys to navigate within a complex widget, such as a menu or spreadsheet. The changes that WAI-ARIA introduces in keyboard navigation make this enhanced accessibility possible. Tabbing in the document should follow a logical navigation structure. Authors implementing arrow key navigation should, where possible, follow the design patterns in the WAI-ARIA Authoring Practices Guide [ ARIA-PRACTICES ]. When using these features, it is important as always to ensure keyboard navigation is logical. Synchronize the visual interface with the accessible interface. This will allow the state of your UI to be perceivable to the user as well as assistive technologies. For example, the author should use the appropriate WAI-ARIA attribute on a form element that is visually styled to appear required (aria-required) or a gridcell that is visually styled to appear selected (aria-selected (state)). Authors may choose to achieve visual synchronization of these interface elements by using a script or by using CSS attribute selectors. Refer to the WAI-ARIA Authoring Practices [ ARIA-PRACTICES ] for techniques on proper UI synchronization with the accessible state of the document. A basic tree view allows the user to select different list items and expand and collapse embedded lists. Arrow keys are used to navigate through a tree, including left/right to collapse/expand sub trees. Clicking the visible expander button with the mouse also toggles expansion. Further keyboard implementation details for tree widgets may found in the [ WAI-ARIA Authoring Practices Guide Design Patterns [ ARIA-PRACTICES , section 9]. Expose the changing states (expanded and collapsed) of the tree items. Although standard list behavior is supported by the native ul and li elements in HTML, there is no element that natively supports list expansion and selection. Since there is not, we will need to use roles. tree: A tree is the main container element for our tree. It is a form of a select where sub-level groups of treeitems may be collapsed and expanded. treeitem: A treeitem is an option item of a tree. This is an element within a tree; sub-level groups of treeitems may be expanded or collapsed. group: A group encloses a set of sub-level treeitems. Tree relationships can be made simply via the DOM and logical structure of the page. A tree element will be the main container encompassing all other elements in the tree. Each selectable item in the tree will be a treeitem. When a treeitem contains an embedded list of treeitems they will be all be embedded in a group. A group should be contained inside the tree item that is the parent item. The use of aria-expanded should mirror that which is visibly expanded on screen, so authors may wish to use CSS attribute selectors to toggle visibility or style of an item based on the value of an WAI-ARIA state or property. The following example would hide the sub-level groups of a collapsed tree node. Note: At the time of this writing, this CSS example, while technically correct, will not redraw styles properly in some browsers if the attribute's value is changed dynamically. It may be necessary to toggle a class name, or otherwise force the browser to redraw the styles properly. Sometimes a tree structure is not explicit via the DOM and logical structure of a page. In such cases the relationships must still be made explicit using the states and properties. In the following example, the aria-owns attribute indicates that the div with id "external_treeitem" should be considered a child of the ul element with the attribute, even though it is not a child in the DOM. Sometimes trees (and other lists or grids) cannot be completed represented in the DOM due to performance limitations of the browser. For example, an application interface may only need to display 100 items out of a set of 100,000. Including all 100,000 items in the DOM could cause performance problems on both the client and server machines. If items in a managed widget are loaded, for example, via the XMLHttpRequest object, and not present in the DOM at all times, authors should use aria-level, aria-posinset and aria-setsize, and ensure that aria-owns is not required to convey membership with the widget. By adopting WAI-ARIA, both developers of static web sites and of dynamic Internet applications can improve the usability, accessibility, and scalability of their products. Developers of static web content can continue to follow the 1999 WCAG 1.0 standards, while improving usability and accessibility through the use of WAI-ARIA landmark roles, aria-labelledby relationships, and properties like aria-invalid (state) and aria-required that can apply to HTML form controls. In richer, dynamic content, developers create custom widgets like calendars and spreadsheets based on technologies such as Ajax and CSS; to achieve accessibility, they need to use WCAG 2.0. Previously, when delivering rich Internet applications to users, to comply with WCAG 1.0, developers resorted to providing alternative, static content. While such measures met the WCAG 1.0 requirements, people using assistive technologies were not provided the richer user experience. When tables are used for layout, rather than CSS absolute positioning, historically, they have been problematic for assistive technologies to interpret. When the WAI-ARIA role of presentation is used on such tables, the assistive technology ignores the table structure, providing a more accessible experience without requiring major recoding. All keyboard-accessible controls must be either forms or anchors, forcing the user to tab through all focusable elements on the web page to navigate. If you need to navigate from the first link on the page to the last link on the page, that could be a very long trip and takes usability a step back. Without WAI-ARIA semantics, you cannot provide contextual information to the user. If you repurpose HTML elements you cannot provide the appropriate role and context information for the new widget. Lack of context is a serious usability problem. WAI-ARIA semantics results in providing contextual information to the user. CSS is used for absolute positioning. If you remove that capability, usability features of widgets like pop-up menus disappear. Imagine activating the file menu and the menu showing up at the bottom of the page. WAI-ARIA and WCAG 2.0 coding techniques are useful for developing content and applications that can scale across a variety of user agents, including those on mobile devices. For all these reasons, adopting WAI-ARIA makes good technical as well as business sense. For a further illustration, compare how accessibility is achieved with WCAG techniques without and with WAI-ARIA, as shown in Figure 7.0. Editor's Note: Figure 7, described as WAI-ARIA tree widget usability comparision, refers to a resource that has not yet been found. Figure 7.0 shows an "accessible" widget for a tree item, within a tree widget, using WCAG 1.0 without WAI-ARIA, which ,when supplied to a screen reader, may say "link folder Year." There is no information to indicate that the folder is closed (aria-expanded (state) = "false"). There is no information to indicate its depth (aria-level="2"), position in the set and the set size at the level, all of which provides the user with context something sighted users may take for granted. The role is used to indicate that it is a treeitem which indicates that the item should behave and navigate with the keyboard like a tree item. A screen reader using the WAI-ARIA version might say "Closed Folder Year, Closed Folder one of two, Depth two, unchecked." Furthermore, the WAI-ARIA version can allow the tree items to be navigated with arrow keys and without requiring they be navigated as part of a global web page tabbing scheme. This is not what any user would expect of a tree widget. Finally, if you were told all widgets were links on the web page, consider how usable -- or not -- that would be. Because WAI-ARIA is being developed through the PFWG with cooperation from browser and assistive technology vendors, accessibility and interoperability with those technologies will be easier to achieve, reducing or eliminating the need for per-browser and per-screenreader coding to achieve accessibility. In addition to people with disabilities, all users benefit from WAI-ARIA because it establishes a Web-standard for keyboard interaction, easing the learning curve for users moving among applications, sites, and browsers. Implementing WAI-ARIA can facilitate test automation. Test engines require semantic information about user interface elements, unique names, exposure of state, specific properties in order to run automated test scripts. WAI-ARIA provides that semantic information needed for efficient test automation. This primer is designed to address the accessibility of dynamic, scripted, Web content that may be rendered in today's browsers while bridging to future declarative standards, such as XHTML2, in the W3C. The extensions being created for XHTML 1.X are intended to be cross-cutting. This primer clearly indicates that the Web Content Accessibility Guidelines (WCAG) [ WCAG20 ], the Authoring Tool Accessibility Guidelines (ATAG) [ ATAG2 ], and the User Agent Accessibility Guidelines (UAAG) [ UAAG ] should be in lock step for a common strategy. The web, tool, and user agent groups are effected and are interdependent. Additionally, close work with mainstream working groups, like HTML, CSS, and Device Independence will not only produce a working solution but it will produce a working solution that will have a broader impact than just XHTML. Moreover, this convergence stands to benefit users and businesses in significant measure. * Value Change User Agent to monitor valuenow, valuemax, and valuemin states in the WAI-ARIA Roles, States, and Properties for (X)HTML. For properties representing platform accessibility API values as specified by a given role, it will generate an accessible value change event. (See State Change Event below). User Agent to monitor specific accessibility states and properties in the WAI-ARIA Roles, States, and Properties for (X)HTML. For states and properties representing platform accessibility API states or properties specified by a given role, it will generate an accessible state or property change event. (See State Change Event below). Table 2.0 shows the roadmap for filling the gaps in Table 1.0 for (X)HTML. The effort is designed to fill the gaps for HTML content using the W3C technique to embed role and state attributes into HTML documents. Required components marked with an asterisk indicate gaps to fill in the roadmap. For graphics that need longer descriptions, see the following items. Model provides the Data for the DOM Node. View is the user interface for a standard user agent. Input is received form the Document Element controller and passed to the AT through the contract filter. Input is received from the user and passed to the Document Element controller through the contract filter. Resources referenced informatively provide useful information relevant to this document, but do not comprise a part of its requirements. Accessible Rich Internet Applications (WAI-ARIA) 1.0 . J. Craig, M. Cooper, L. Pappas, R. Schwerdtfeger, L. Seeman, Editors, W3C Working Draft (work in progress), 16 September 2010. This version of WAI-ARIA is available at http://www.w3.org/TR/2010/WD-wai-aria-20100916/. Latest version of WAI-ARIA available at http://www.w3.org/TR/wai-aria/. WAI-ARIA Authoring Practices . J. Scheuhammer, M. Cooper, L. Pappas, R. Schwerdtfeger, Editors, W3C Working Draft (work in progress), 16 September 2010. This version of WAI-ARIA 1.0 Authoring Practices is available at http://www.w3.org/TR/2010/WD-wai-aria-practices-20100916/. Latest version of WAI-ARIA Authoring Practices available at http://www.w3.org/TR/wai-aria-practices/. Roadmap for Accessible Rich Internet Applications (WAI-ARIA Roadmap) , R. Schwerdtfeger, Editor, W3C Working Draft (work in progress), 4 February 2008. This version of WAI-ARIA Roadmap is available at http://www.w3.org/TR/2008/WD-wai-aria-roadmap-20080204/. Latest version of WAI-ARIA Roadmap available at http://www.w3.org/TR/wai-aria-roadmap/. Authoring Tool Accessibility Guidelines 2.0 , J. Richards, J. Spellman, J. Treviranus, M. May, Editors, W3C Working Draft (work in progress), 8 July 2010, http://www.w3.org/TR/2010/WD-ATAG20-20100708/. Latest version of ATAG 2.0 available at http://www.w3.org/TR/ATAG20/. Gnome Accessibility Toolkit . Available at http://library.gnome.org/devel/atk/unstable/. The Mac OS X Accessibility Protocol . Available at: http://developer.apple.com/library/mac/documentation/Cocoa/Conceptual/Accessibility/cocoaAXIntro/cocoaAXintro.html. Document Object Model (DOM) Level 2 Core Specification , L. Wood, G. Nicol, A. Le Hors, J. Robie, S. Byrne, P. Le Hégaret, M. Champion, Editors, W3C Recommendation, 13 November 2000, http://www.w3.org/TR/2000/REC-DOM-Level-2-Core-20001113/. Latest version of DOM Core available at http://www.w3.org/TR/DOM-Level-2-Core/. Document Object Model (DOM) Level 2 Events Specification , T. Pixley, Editor, W3C Recommendation, 13 November 2000, http://www.w3.org/TR/2000/REC-DOM-Level-2-Events-20001113/. Latest version of DOM Events available at http://www.w3.org/TR/DOM-Level-2-Events/. Java Accessibility API (JAPI) . Available at http://www.oracle.com/technetwork/java/javase/tech/index-jsp-140174.html. Microsoft Active Accessibility (MSAA) . Available at http://msdn.microsoft.com/en-us/library/ms697707.aspx. OWL Web Ontology Language Overview , D. L. McGuinness, F. van Harmelen, Editors, W3C Recommendation, 10 February 2004, http://www.w3.org/TR/2004/REC-owl-features-20040210/. Latest version of OWL Overview available at http://www.w3.org/TR/owl-features/. 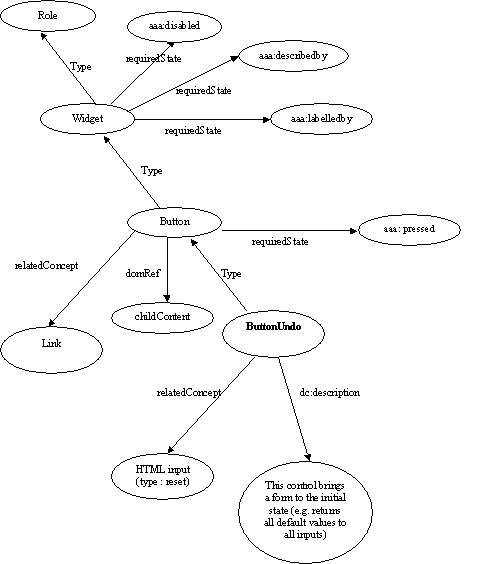 Resource Description Framework (RDF): Concepts and Abstract Syntax , G. Klyne, J. J. Carroll, Editors, W3C Recommendation, 10 February 2004, http://www.w3.org/TR/2004/REC-rdf-concepts-20040210/. Latest version of RDF Concepts available at http://www.w3.org/TR/rdf-concepts/. Role Attribute, S. McCarron, Editor, W3C Working Draft (work in progress), 5 August 2010, http://www.w3.org/TR/2010/WD-role-attribute-20100916/. Latest version of Role Attribute available at http://www.w3.org/TR/role-attribute/. User Agent Accessibility Guidelines 1.0 , I. Jacobs, J. Gunderson, E. Hansen, Editors, W3C Recommendation, 17 December 2002, http://www.w3.org/TR/2002/REC-UAAG10-20021217/. Latest version available at http://www.w3.org/TR/UAAG10/. Microsoft Accessibility Model (UI Automation) . Available at http://msdn.microsoft.com/en-ca/windows/bb735024.aspx. Web Content Accessibility Guidelines 1.0 , W. Chisholm, G. Vanderheiden, I. Jacobs, Editors, W3C Recommendation, 5 May 1999, http://www.w3.org/TR/1999/WAI-WEBCONTENT-19990505/. Latest version of WCAG 1.0 available at http://www.w3.org/TR/WAI-WEBCONTENT/. Web Content Accessibility Guidelines 2.0 , B. Caldwell, G. Vanderheiden, L. Guarino Reid, M. Cooper, Editors, W3C Working Draft (work in progress), 11 December 2007, http://www.w3.org/TR/2007/WD-WCAG20-20071211/. Latest version of WCAG 2.0 available at http://www.w3.org/TR/WCAG20/. The following people contributed to the development of this document. Special thanks to Aaron Leventhal for effort and insight as he implemented a working prototype of accessibility API bindings. Special thanks to Al Gilman for his work while chair of the PFWG in bringing the ARIA technology to fruition. Jim Allan (TSB), Simon Bates, Chris Blouch (AOL), Judy Brewer (W3C/MIT), Christian Cohrs, Donald Evans (AOL), Geoff Freed (WGBH/NCAM), Becky Gibson (IBM), Alfred S. Gilman, Andres Gonzalez (Adobe), Jeff Grimes (Oracle), Barbara Hartel, Earl Johnson (Sun), Jael Kurz, Aaron Leventhal (IBM Corporation), Alex Li (SAP), Linda Mao (Microsoft), Shane McCarron (ApTest), Lisa Pappas (Society for Technical Communication (STC)), Dave Pawson (RNIB), David Poehlman, Marc Silbey (Microsoft Corporation), Henri Sivonen (Mozilla), Vitaly Sourikov, Mike Squillace (IBM), Ryan Williams (Oracle), Tom Wlodkowski. This publication has been funded in part with Federal funds from the U.S. Department of Education, National Institute on Disability and Rehabilitation Research (NIDRR) under contract number ED05CO0039. The content of this publication does not necessarily reflect the views or policies of the U.S. Department of Education, nor does mention of trade names, commercial products, or organizations imply endorsement by the U.S. Government.